If you have a leaking water heater, follow the instructions below to turn off your leaking water heater. You can also call 1-800-835-8041 and one of our water heater experts will walk you through turning off your water heater. Twist the dial on the top or front of the thermostat from the “on” to the “off” position. This will turn off the gas at the water heater. If you ever smell gas – exit the home and contact the gas company immediately. 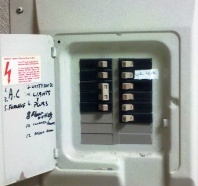 Find your breaker box and flip the breaker for your electric water heater. 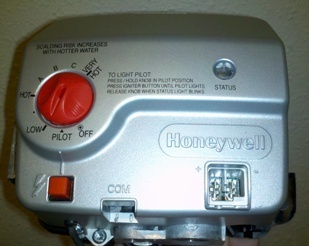 If your water heater has a disconnect switch close to the water heater simply turn off the switch to turn off power to the water heater. Find the cold side water pipe connected to the water heater. Follow the water pipe back to the source or the wall – you should see a water shut off valve. If you have an old style (Gate) turn faucet handle – Twist the handle clockwise until it stops. This should turn of the water. If you have a newer lever style ball valve. Pull or push the handle a quarter turn – this should turn off the water. 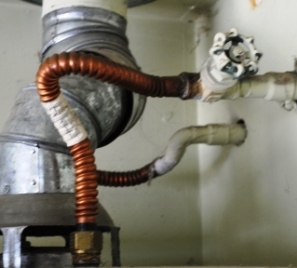 Drain the water heater if necessary to avoid any damage. Connect a garden hose to the bottom drain valve on the water heater. Run the other end of the hose to a lower location where hot or rusty water will not cause damage. Hot water can damage grass and plants. 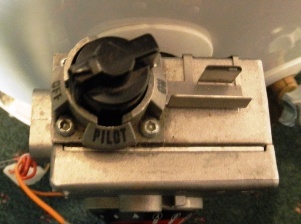 Open the valve on the water heater by turning the knob or insert a screw driver into the notch and turn. Open the hot side faucet in the sink closest to the water heater. 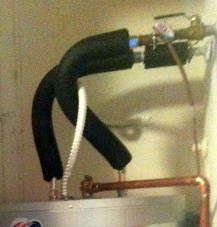 This will release the vacuum seal and let the water drain out of the water heater. Allow 10-30 minutes for the water heater to drain. What now, that you have turned off your leaking water heater? 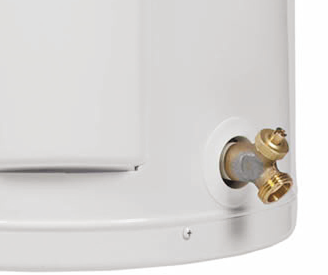 Contact us 24/7/35 to discuss options about repairing or replacing you hot water heater. Our experts are happy to help answer questions about possible problems. You can also read our reviews and learn why our customers rated us 5 stars!